A. designsponge.com and designsponge.net were taken by another company. Q. will the old site still be here on monday? A. yes. i don't want old links to break so i'm leaving it up for a while. Q. will all the old posts and comments be on the new site? I am so happy for you! I've been reading you faithfully for 3ish years now and I appreciate you very much! Congratulations as your blog continues to grow and change! this sounds great - i love design*sponge and i look forward to following you over at the new site. well done grace. LOVE your site, I read it religiously...just fyi: currently, when trying to access designspongeonline.com, it asks for a username and password. Way to go, Grace. You are so inspiring, bringing your flair and keen eye to the internet. Best of luck with the new site- can't wait to see it!!! the site will be password protected while we fix some glitches. Congratulations! I can't wait to see the new site! Congratulations. I love design*sponge and look forward to the new site. Oh and enjoy Montauk - it is one of my family's favorite spots on earth. I wouldn't pass up Bird on the Roof for breakfst though. One block off Main Street towards the ocean. The pancakes are the best! Can't wait. :) Love progress. congrats grace! looking forward to seeing it! Congratulations. Your site is a new discovery for me which i now look forward to reading every morning. I can't wait to see the new site. Good luck, and thank you for bringing beauty into my life daily. Looking forward to more tagging along for the ride! Congrats on this huge achievement! this is fantastic news! how wonderful for you. looking forward to the new site. enjoy your getaway. so exciting! congrats grace - look forward to seeing it live! Congrats on the changes. Tech issues/transitions drive me nuts, but I can't wait to see the new features! Congratulations change = growth always good. 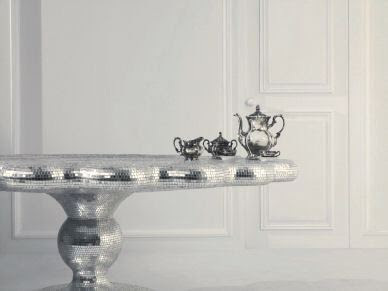 I love the glam table. Yay for your own domain! Look forward to seeing the new site! good luck. see you on the other side. Congrats! I had a feeling this move would be coming sometime. I am sure it won't take long to build links to the new URL. A word of advice: post ONCE more from here with the new RSS feed for designspongeonline.com pretty pretty pretty please!! I read you via feed, and since I can't add the new feed now (I'm getting a weird password thing), I (and I'm sure a ton of others) will probably forget to check the actual site come tomorrow to add the feed then. A simple, "here's the new feed address" here on this blogspot one will do! A big big congratulations. Well done. Looking forward to seeing the new site. I know you've been in good hands, so I cannot wait to see!! Enjoy the weekend away - what great weather for the end of September. Enjoy! I can't wait to see it live, 'dude'! And I'm so excited for your sneak peek - my only fear is that I will want to completely redecorate! many congrats ~ i can't wait to see the new d*s space! oh the anticipation! I can't wait either! Here's to your next adventure - it only gets better! wheee, sneak peek time! love that bathroom, love it! Woohoo!! I'm so excited to see it! Congratulations, Grace! Yay! Congrats, and best of luck with the move. It may be only virtual, but that doesn't mean it's not a lot of work. As one door closes another door opens - congrat Grace on this exciting move!!! Can't wait to see what you have in store for us!!!! me too can't wait to see it, have a good weekend! enjoy your time this weekend - relax and recharge - you've had your hands full! super BIG congratulations all around! Congrats Grace on the new move. I really look forwardt seeing where this leads you in the future! Can't wait for the sneak peak too. How exciting Grace. Can't wait until monday :) Good luck! Can't wait till monday !!! I am dying to see your sneak peek and new features ! I look forward to seeing the new site on Monday. I also updated the link on my blogroll. Keep up the good work. You rock. I'm using the opportunity to let you know how much i love the work you do... I'm a design student in Kansas & ever since seeing you at the IDSA Chicago conference this site has been my homepage! Looks like I'll be changing it now tho.... Best of luck!! Best wishes Grace! You've got to be one of the hardest working design bloggers out there and I'm sure this new site will reflect your very high standards for quality all around. I look very much forward to experiencing the new look and feel! I'm excited for you and excited for me! Can't wait to see the new digs. Congratulations Grace and thanks for all the beautiful work that you do,it's so inspiring,can't wait to see the new site! Great new, i'm happy you have moved to a new own site. Sounds good, I just hope the archives will still be there, I refer back to them all the time. Good luck at the new site!